RF coaxial surge protector (sometimes referred to as a lightning arrestor or surge suppressor) PE73SP1025 from Pasternack is in-stock and will ship same business day as it is purchased. This radio frequency coax surge protector suppressor protects against high electromagnetic pulses (EMP) / power surges that are typically caused by lightning or severe electrical changes. Our Type N F/F in/out coax RF surge protector, 1.5MHz - 700MHz, DC block, 2kW, 50kA, blocking cap and gas tube is typically used with a RF system of one or more components exposed to the outdoors, like an antenna. The coaxial lightning surge arrestor is designed to pass through the desired frequency range while protecting the RF equipment from DC surges. This Pasternack coax surge protector PE73SP1025 is 50 Ohm and has a type N input. The 50 Ohm N type surge protector is a female gender for input and type N in female for output. Our type N F/F surge protectors utilize blocking cap and gas tube protection technology. 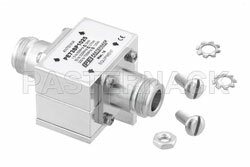 The frequency range of this blocking cap and gas tube type N F/F lightning surge arrestor is 1.5 MHz to 700 MHz. Power handling maximum of PE73SP1025 is 2,000 W. The Pasternack 2,000 Watts N type surge suppressor is rated at 3500 uJ let-through. This coax lightning protection component has a 600 maximum voltage. Additional product specs and CAD drawing with dimensions for this female to female type N surge protector from Pasternack can be found in the details of the specifications datasheet PDF on this page. 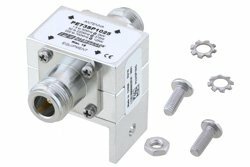 Pasternack is a supplier of one of the broadest and deepest inventory of RF, microwave and millimeter wave components available for shipping same business day. Our ISO 9001:2008 registered facilities will ship the coaxial surge protector components from stock the business day of your purchase. Expert technical support and a friendly, knowledgeable sales team are here to help you with your RF requirements. These and many other reasons are why Pasternack is one of the best websites where to find and buy coaxial N type surge protector products.